2012 62 MINI COUNTRYMAN 2.0 COOPER SD ALL4 5 DOOR AUTOMATIC 141 BHP WRAPPED IN MATE BLACK WITH 27200 MILES WITH SAT NAV,LEATHER AND HEATED SEATS . 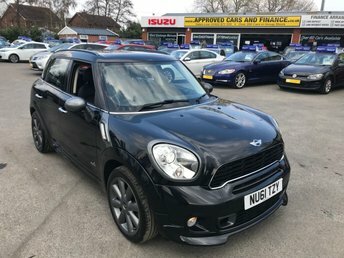 APPROVED CARS ARE PLEASED TO OFFER THIS MINI COUNTRYMAN 2.0 COOPER SD ALL4 5 DOOR AUTOMATIC 141 BHP WRAPPED IN MATT BLACK WITH A HUGH SPEC INCLUDING SAT NAV,ALLOYS,FULL BLACK LEATHER INTERIOR,DAB RADIO AND MUCH MORE WITH A FULL SERVICE HISTORY A VERY RARE CAR IN THIS COLOUR AND A GREAT SPEC. 2013 13 MINI COUNTRYMAN 2.0 COOPER SD 5d 141 BHP IN METALLIC GREY WITH 52000 MILES IN STUNNING CONDITION. 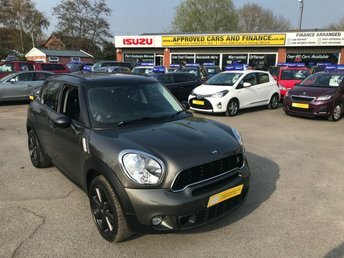 APPROVED CARS AND FINANCE ARE PLEASED TO OFFER THIS MINI COUNTRYMAN 2.0 COOPER SD 5 DOOR 141 BHP IN METALLIC GREY WITH A FULL SERVICE HISTORY AND A GREAT SPEC AUTOMATIC LIGHTS, BLUETOOTH, CRUISE CONTROL AND MUCH MORE. NOT A VEHICLE TO BE MISSED VERY PRETTY VEHICLE AND DRIVES SUPERB. 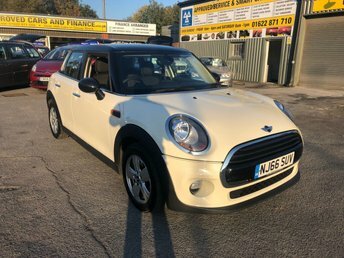 APPROVED CARS ARE PLEASED TO OFFER THIS MINI HATCH COOPER 1.5 COOPER 5 DOOR 134 BHP IN WHITE WITH ONLY 25000 MILES,1 OWNER WITH A GREAT SPEC INCLUDING A 6 SPEED GEARBOX,AIR/CON,REAR PARKING SENSORS,DAB RADIO,BLUETOOTH AND MUCH MORE WITH A FULL MINI SERVICE HISTORY A GREAT MINI 5 DOOR AT A VERY SENSIBLE PRICE. 2013 63 MINI COUNTRYMAN 2.0 COOPER SD 5 DOOR AUTO 141 BHP IN RED WITH 50200 MILES IN IMMACULATE CONDITION. 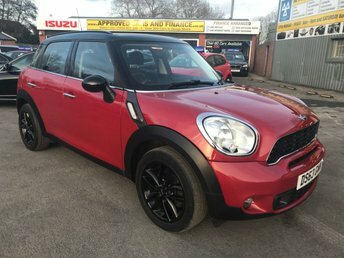 APPROVED CARS ARE PLEASED TO OFFER THIS MINI COUNTRYMAN 2.0 COOPER SD 5 DOOR AUTO 141 BHP IN RED WITH 50200 MILES IN BRIGHT RED IN IMMACULATE CONDITION INSIDE AND OUT WITH A GOOD SPEC INCLUDING A FULLY AUTOMATIC GEARBOX AND A FULL SERVICE HISTORY SERVICED AT 17K,21K,34K AND WE WILL SERVICE THE CAR FOR ITS NEW OWNER A RARE MINI AUTOMATIC THE ONE TO OWN. 2014 64 MINI ROADSTER 1.6 COOPER 2d 120 BHP CONVERTIBLE IN WHITE WITH BLACK HALF LEATHER INTERIOR. 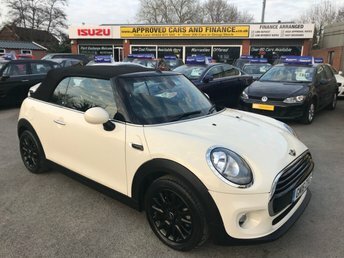 APPROVED CARS ARE PLEASED TO OFFER THIS MINI ROADSTER 1.6 COOPER 2 DOOR 120 BHP CONVERTIBLE IN WHITE WITH BLACK HALF LEATHER SEATS WITH A BLACK ROOF IN GREAT CONDITION INSIDE AND OUT WITH A GOOD SPEC AND A FULL SERVICE HISTORY A GREAT LITTLE MINI CONVERTIBLE FOR THE SUMMER. 2014 14 MINI HATCH ONE 1.2 ONE 3 DOOR 101 BHP IN WHITE WITH PANORAMIC ROOF AND ONLY 33600 MILES. 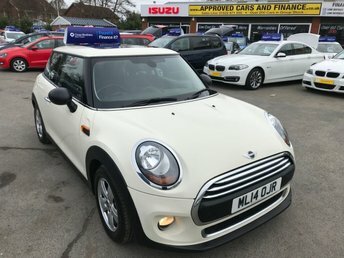 APPROVED CARS ARE PLEASED TO OFFER THIS MINI HATCH ONE 1.2 ONE 3 DOOR 101 BHP IN WHITE WITH PANORAMIC ROOF AND ONLY 33600 MILES IN GOOD CONDITION INSIDE AND OUT WITH A FULL SERVICE HISTORY AND A GOOD SPEC INCLUDING A PANORAMIC ELECTRIC ROOF,STOP/START,ALLOYS,BLUETOOTH,DAB RADIO AND MUCH MORE A GREAT LITTLE MINI 1.2 AND SUPER ECONOMICAL AND CHEAP TO INSURE. APPROVED CARS AND FINANCE ARE PLEASED TO OFFER OUR MINI HATCH ONE 1.4 ONE 3 DOORS 94 BHP IN BLACK AND IN GOOD CONDITION. GOOD SPEC INCLUDING ABS,POWER STEERING,ALLOY WHEELS,CD PLAYER AND MUCH MORE. GOOD SERVICE HISTORY IS ALSO INCLUDED WITH THE VEHICLE BUT DUE TO THE AGE AND MILEAGE OF THE VEHICLE WE ARE OFFER OUR CAR AS A TRADE CLEARANCE. PLEASE CALL 01622-871-555 TO BOOK A TEST DRIVE TODAY. Ready for a MINI adventure? Pay a visit to Approved Cars Ltd (Approved Cars Izusu) today and take a closer look at the full range of used MINI cars for sale in East Peckham. Whether you're looking for a fun city runabout like the MINI 3-Door Hatch or a stylish cabriolet such as the MINI Convertible, our team is ready and waiting to help. We stock affordable used cars to suit every budget and you can buy with confidence as each one of our vehicles is thoroughly inspected before going on sale. Discover more or arrange to take a test drive in the used MINI of your choice by contacting a member of the team at Approved Cars Ltd (Approved Cars Izusu) today.